Hi everyone! As promised I have another post in the ‘Daily Homeschool Schedule’ series for you all. As mentioned last week, I’ve had countless questions about our daily schedule. And you can see an overview of our daily schedule here. But today I wanted to share Tinker Bell’s schedule with you. She’s currently 7 years old, and in 2nd grade. This year we are doing quite a bit of things. Some days have been challenging due to our recent move. But we’re remaining flexible and at the very least getting our core work completed each day! As you can see we do most things on a daily basis right now. Normally I alternate History and Science so we’re doing them 2x per week, but this year’s Abeka curriculum requires daily work. You can see a full list of Tinker Bell’s actual curriculum below. We are trying out a few new things this year. So far it is going well. Bible: Grapevine Studies, and I might add in a Kay Arthur Discover 4 yourself kids unit. Robotics: LEGO Education We’re using the Simple Mechanisms set this year. Science: Abeka Science 2 & some of my scientist units. The only thing I don’t totally love is the Wordly Wise program. I’d love to hear anyone else’s suggestions for vocab! Have a comment to share on how.you organize your day? Make sure to leave it below! 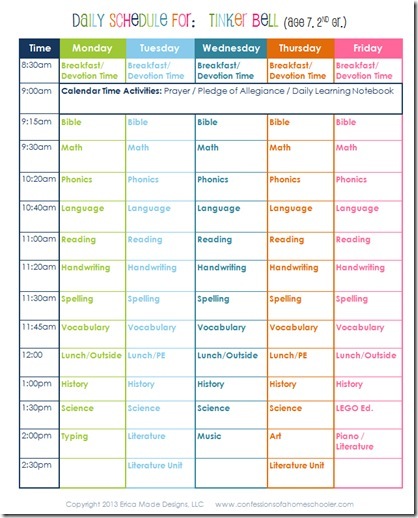 Thanks for sharing your schedule; nice to view how fellow homeschoolers organize their days! Our daughter is using All About Spelling (half way through 2) and All About Reading (starting 2) this year. I’d be interested to hear from anyone who follows both of these at the same time just how much time you devote to them. Thanks so much for sharing Erica! I love your blog and have purchased several of your printables that I am so excited about! Heather, you read my mind… I am using AAS and AAR and wondered how long people usually take to get through a lesson with this curriculum. My son was doing the lessons fairly quickly until we got to around mid way through the Level 1 book and he is now struggling a bit more and getting frustrated which of course makes teaching reading twice as difficult! I have slowed down our lessons and make sure to do more review, however, I would be interested to see how much time others using these curriculums are taking to get through the individual lessons. 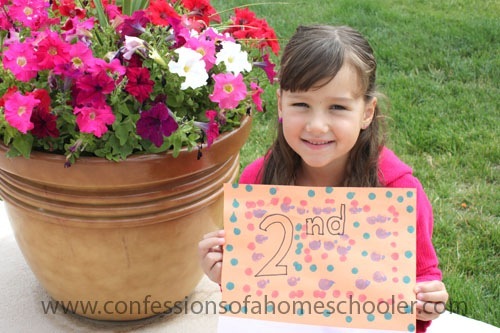 Thanks again for putting out so much helpful homeschool information Erica! It has helped me tremendously in our new homeschooling journey! Combining Evan -Moore’s (EM) A Word a Day and Marie’s Words (MW) has really worked well for all ages here. K-11th. I use the blank vocabulary sheet that comes with the EM book for MW and for the “vocabulary every high schooler should know” list. We also brainstorm where we have either read or heard the word used. We do this during circle time/morning meeting but it could easily be put in a workbox. It seems to stick because the words seem less random when we approach them this way and therefore become more concrete. Hi Erica! Thank you for sharing this. I have a question that can be addressed maybe in a future post. 🙂 When do YOU prepare for homsechool? I also have four children, though my oldest is 2nd grade and the youngest is 2 (they are ages 7, 5.5, 3.5 and 2). When it comes to planning the week ahead, getting printables laminated / in order for the coming week (we’re using your LOTH curriculum with our 3.5 year old for preschool! ), printing and cutting out lapbook components, etc… when do you do all that? Like you, I also work part time and just struggle to get it all done. Thank you in advance for your insight! I’m in the same boat, or I will be in half a year, kids will be 7, 5.5, 3.5 and 1.5! So I’m wondering the same. Op, when do you get dressed? Prepaare food? Do you go to co-ops or outside classes? I love those, but it feels like it takes days to get back on schedule. How does she sit without breaks?!? My son (7, 2nd grade) can’t make it more then about 1.5 hours and he needs at least a 15-20min break. Then we have to work on getting refocused etc. Also, what do you do when it takes her longer to work through lessons then the time you give her? Thanks so much for all your resources! I use so many of them with all 3 of my kids!! I too am wondering about breaks. How do you do that much work in one sitting?? My boys would go nuts!! wow- we could never work on that kind of a schedule- we lose so much in transition time- we end up doing things in 1.5 hour blocks once a week (except for 30 min of math/la which is daily). Me too. Too many interruptions from young ones in addition to needing breaks. Trying to keep lessons shorter periods, use many manipulatives, and keep paper pencil work from taking over especially in primary and preschool ages. Hi Erica! I ordered your letter of the week curriculum back in August, and I absolutely love it! I do have a question for you, but I can’t find an email address on your web site. Would you mind contacting me at brandy.thixton@yahoo.com? (Order #43842). Thank you! Your schedule looks a lot like mine!!! (I laugh when I see all 4 of my kids schedules on the same page!) Just a quick note about Vocab….we too started with Wordly Wise 3000, and it was fine but I wasn’t in love with it either. We have since switched to Dynamic Literacy. Kids seem to like it and I like the theory behind the teaching. Hi, i think your website is awesome :). But i have a question i want to start homeschooling my 2 kids, current age 10 & 7. But can they apply for university when they finish the school ? how that works! Hi Veronica! I’m in the same boat – 2 boys, 10 and 6 in public school. I’ve found out that most colleges and universities use the same criteria in admittance for homeschoolers as they do for public shoolers. I think the biggest difference that if your homeschool records are kept up throughout the year (grades, a report card, attendance, tests of some kind whether they be online or required, and a good portfolio of High school credits) Each state has different Homeschool Laws – some require reporting to the state ever year. Texas has no State mandated requirements. We dont have to grades, test scores or comply with a certain number of hours/ days. Check into your homeschool laws for your state and call the admissions office at a local university. Good luck!! Me Too! Hi! We use English From the Roots Up for vocabulary. It teaches Latin and Greek roots which I think goes a lot farther towards helping them with new words then learning a bunch of English words in isolation. If you are interested in how it works, feel free to email me.